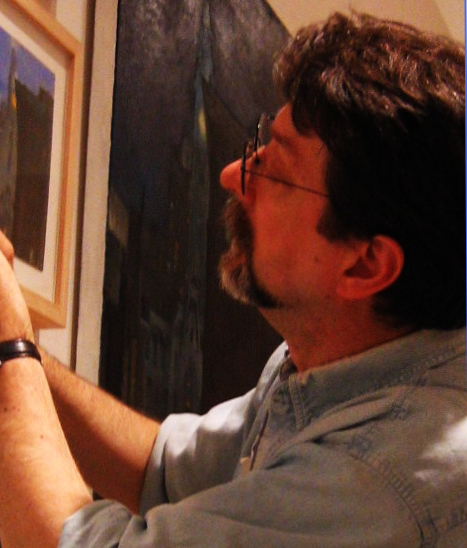 Patrick Crofton is a semi-retired make-up artist, and a painter of portraits and cityscapes. Patrick hanging some of his paintings in an exhibition at the Pennsylvania Academy of the Fine Arts. In 1981 I was living in Cape Town, South Africa, where I had grown up. A friend invited me to visit him in New York, and while there I met and fell in love with a man who turned out to be my life partner—we were recently married after spending more than thirty-three years together. I had to return to Cape Town after a couple of months of our being together to begin the immigration process, and also to see whether the new relationship would survive being separated. After about nine months I was able to return, and we’ve been together ever since. Leaving there was a bit of a wrench, as I was very close to my mother who was my only living parent at that point. I have a sister as well, and at least she and her own growing family were able to provide some distraction for our mother. Professionally it was a bit of a gamble as I was fairly successful in South Africa in my career, admittedly though a big fish in a small pond! Fortunately things turned out fine and I’ve done very well. Initially adjustments had to be made by both of us, but I’m very glad I stuck it out. I do miss some friends I had in South Africa very much, and am still in touch with a few . . . the new technology has made it very easy. I was given a number of send-off parties by friends, who possibly thought that I’d be back soon. At that point though, many people were exploring their options for leaving South Africa, as the future there seemed (and indeed still does seem) uncertain. I don’t really remember a sense of finality on the day I left, just mostly being excited at reconnecting with my lover and being quite optimistic about the future. I flew into JFK, returning about nine months after we had met. I had already made some professional connections, which gave me a reason to hope for a bright future in the States. I think I expected it to work out from day one. Obviously there were times I was homesick but periodic visits from my mother and friends, and trips back to South Africa, did much to help, as well as the fact that every time I went back I realized how increasingly insecure and precarious life had become there. I assimilated fairly quickly into the rhythms of life in New York, which seems to be largely made up of immigrants anyway! I have always tried to remain myself though, and am very conscious of my heritage of Anglo-Irish/Dutch ancestors. I would never go back to live in South Africa now, though, as I couldn’t live with that kind of uncertainty. I’m very happy here, and we’ve made a good life for ourselves in Philadelphia, where we both moved in order to study painting. For a while I missed New York far more than I ever missed Cape Town, but we simply can’t afford to live there any more and my partner/husband has developed such an aversion to New York City crowds that we seldom venture there for longer than it takes to see a show! I can’t really say that emigrating to this country has affected my work, as I only really developed my painting after I came to Philadelphia, years after my move. There I was a graphic designer who switched to being a make-up artist, which I continued until we decided to move to Philly to study at the Pennsylvania Academy of the Fine Arts. My painting is principally portraits and cityscapes. I recently made some woodcut prints, though, for my grand-niece in Cape Town for her wildlife conservation cause. My work in general was one of the main reasons I came to this country (apart from falling in love); although successful there, I was part of an industry with limited opportunities and a growing number of competitors fighting over a small amount of jobs.